Standalone HTML web site: A zip file containing a web site with your portfolio data is created. 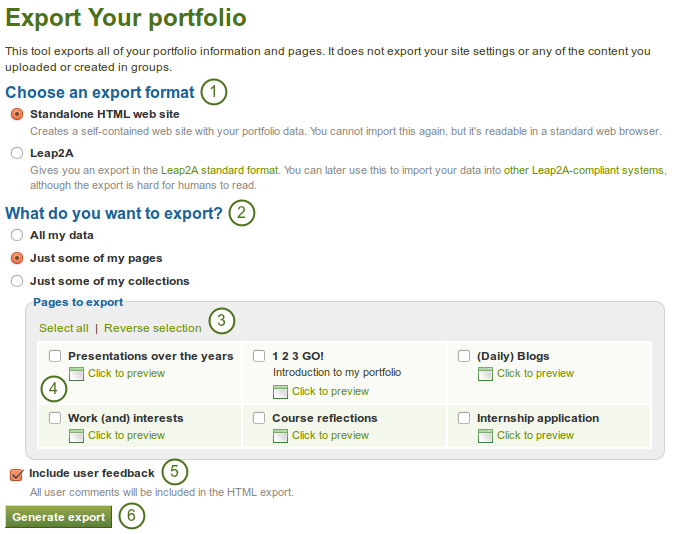 You cannot import this into Mahara or another portfolio system again, but it is readable in a standard web browser and you do not need a Mahara in order to view it. To view this web site, extract the zip file and click on the index.html file that is in the folder. Leap2A: A zip file containing a folder in the Leap2A standard format is created. You can then import this into another Leap2A-compliant system or have it imported by an administrator into your current Mahara or another one. A new user is created during the import process. Choose either Standalone HTML web site or Leap2A. You can run through the export twice in order to get both formats. Just some of my pages: You can then choose which pages and the artefacts that are contained within them you want to export. If you have chosen to export just some pages or collections, you can select them here by clicking on the individual check boxes. Click the Click to preview link to preview a page before you select it. Tick the check box for Include user feedback if user want to keep that in your export. This option is only available when you choose the HTML web site export. If your export gets stuck in the process and the progress bar does not move along at all, your server settings may prevent long operations to avoid slowing down. You will need to contact your site administrator, e.g. via the “Contact us” form in the footer of the page.